There are several reasons why you would need to reset a WordPress password. If your website ever gets hacked, or for some reason you cannot login back to your website, the only way back in is to reset the WordPress password. There are several methods you can use to reset a WordPress password for a specific account. You can reset a WordPress password using FTP, or as explained in this article, you can reset WordPress password using the phpMyAdmin web interface. Follow the three easy steps in this WordPress tutorial to reset a WordPress password within a minute and gain back access to your WordPress blog or website. To connect to the WordPress database with phpMyAdmin, login to your hosting provider cPanel. Scroll down to the Databases section and click on the phpMyAdmin icon which is highlighted in the below screenshot. Once you click on the WordPress database you will see a list of tables. If you have not renamed the table prefixes, all the table names will start with the ‘wp_’ prefix. WP White Security Security Tip: Rename the WordPress database prefix to protect your WordPress from zero day vulnerabilities. If you are not familiar with MySQL and under the hood WordPress technicalities we can do it for you. Click on the wp_users table and click on the Browse tab (highlighted in the below screenshot) to browse the content of this table, i.e. the list of WordPress users and their settings. If you only have one WordPress user, the table will only contain one row as seen in the below screenshot. To modify a WordPress user from phpMyAdmin, such as changing the user’s password, click on the Edit (pencil icon) button. As you can notice from the below screenshot, you can edit any of the user’s property once in this edit mode. The user password is stored as a long string of random characters (MD5 hash) in the user_pass column as highlighted in the below screenshot. WordPress stores the password in such format for security reasons. You can simply start typing the new password in the value section of the user_pass column. Once you specify the new password (Pass123! 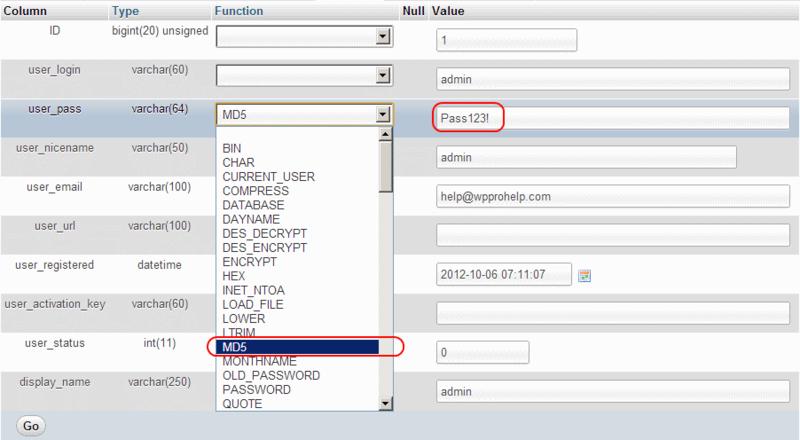 In the below example) select MD5 from the Function column drop down menu for the user_pass column so the password is stored using MD5 checksum and not plain text. Click on Go button to save the new password. Congratulations. 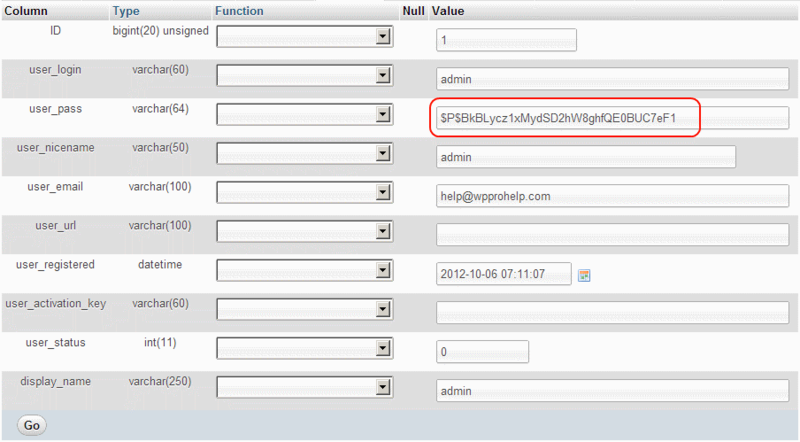 You have just reset a WordPress user password using phpMyAdmin. This was really helpful, and very clear. Thanks for providing this information.